When I wrote about getting the election buzz last week I had forgotten that my least favourite part of the campaign was about to hit. Of course, I say that in a relative sense (since I have seen far too many similar comments misconstrued recently). This isn’t a demoralised, disenchanted or defeatist activist rambling on, but someone who has done enough elections to recognise that he enjoys some parts far more than others! Having spent the past few weeks (months, years) identifying our support through fairly extensive canvassing much of our work now is about reminding them that the election is on Thursday (many people manage to forget) and how and where they can vote. I’m not sure I find it the least enjoyable part of the campaign. Perhaps because it’s the change from continual canvassing to something different or perhaps because it is difficult to do socially (you normally canvass in teams, but end up doing this alone). But whatever the reason, I’m still out there doing it because it is important, this time especially so because we have two elections on the same day and most people will have four votes to cast – one to choose their MP and three to choose their councillors. 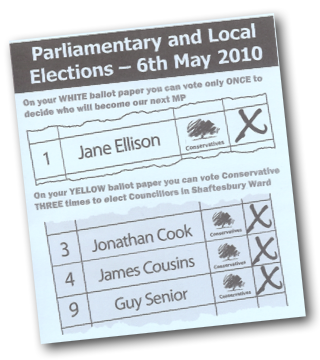 In Shaftesbury I’d be flattered if you could cast your vote for me – I’ll be lurking fourth down on the yellow council ballot paper – but also for my colleagues, Jonathan Cook and Guy Senior for the council and Jane Ellison for parliament.